A burst pipe in the water system is one of the most common plumbing problems both in the home and the public system. Several things can cause burst pipes, the main one been freezing conditions. We have complicated plumbing systems in our homes such as waste disposals, boilers and even garden features that pipe bursts are far from a modern curse. 106 gallons that’s 2 full baths an hour. 2,500 gallons of water or 48 full baths of water after a full day. 2,500 gallons of water in that week or 336 full baths of water. Frozen temperatures and unprotected pipes is the most likely cause of a burst in a home. A pipe bursts when frozen due to the expansion of the water as it becomes ice. This puts pressure on the pipe from the inside and something has to give. This almost always is the soft copper or plastic of the pipe. Sometimes these breaks can be at the weaker joints or in the middle of the pipe. As quite a lot of your piping in your home is hidden in flooring, roof spaces or walls, the damage caused can be devastating. Some pipes will not be accessible, some will be underground while others you may not even know exist. Prevention is by far the best solution, below are several key things you can do to. 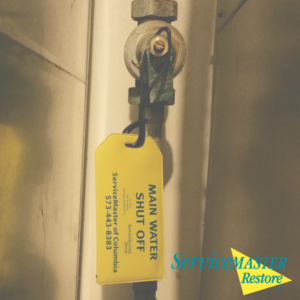 Make sure you know where your main water shut off valve is. Any piping that are in unheated areas such as lofts, basements and garages all need to be wrapped with good quality pipe insulation. Buried pipes need to be buried deep enough and/or insulated. Fix any dripping taps/faucets or existing leaks before the cold spell. Many burst pipes happen because of leaks. Leaving for any length of time, turn off the main water, drain any water from the system and close the taps again (this is very important), leave your heating on. Most heating systems will continue to work without the mains water on for a period of time. Most importantly of all make sure that someone can check on the house from time to time. No matter the prevention taken sometimes burst pipes happen. What you do when you discover one will make the difference between an inconvenience or a total disaster. Here we have highlighted the best action a homeowner can take. Look out for the signs of burst pipes. Not every burst pipe is a torrent of water from the ceiling, look for damp patches on walls, ceilings and floors. Loss of water pressure, unusual noises in the system and even electrical faults all can point to burst pipes. Suspect a burst pipe then isolate the water from the main water shut off. Turn off water and open the taps in the home to remove the water from the system. Call ServiceMaster of Columbia for water removal. Move any furniture and belongings from the affected area, remember insurance does not always cover everything and somethings just cannot be replaced. 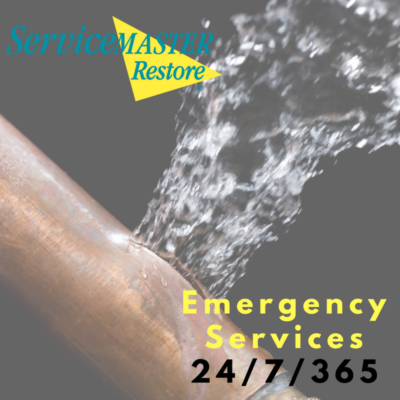 ServiceMaster of Columbia is your 24 Hour Emergency Water Removal company in Mid-Missouri, the Master of Disaster. We will take care of your disaster and restore your peace of mind. We work with all major insurance companies.